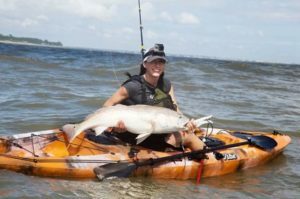 Angela Rants (@SwissArmieLife on Instagram) caught her first saltwater fish while reeling from a kayak off Jekyll Island, Georgia. It was a bull redfish — her first redfish, too (obviously). She figures it weighed 35 or 40 pounds. And that statement offer great insight into Angela: She seeks experiences, and when adversity strikes, she looks for the positives and takes those away with her. Originally from New Mexico, Angela grew up fishing in the San Juans with her dad, an avid fly and trout angler. And because of her dad, Angela’s most memorable (and biggest) fish was a massive lake trout she caught in Utah. After catching the monster, Angela sent a picture to her dad in the hospital. For Angela, the whole experience was a watershed moment in her life. 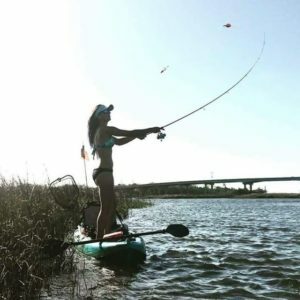 At the same time, working with that first guide, Angela realized the direction in which she wanted to take her fishing career. In particular, Angela loves helping smaller, local guides, tackle shops, and fishing brands market their products. This, in turn, feeds Angela’s soul after some extremely negative experiences in the fishing industry. After giving over a considerable amount of time to the industry, Angela became frustrated that she couldn’t make ends meet unless she was willing to compromise her values and let herself be exploited. So she pulled up her stakes. At the moment she’s settled in Jacksonville, Florida and making her living as a roofer and photographer. 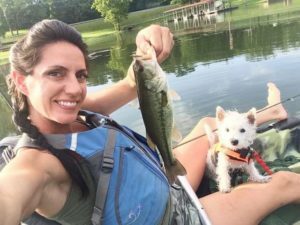 Her current experiment is catching whatever she can on an ice fishing rod — “It fits in my tackle box” — and four-pound-test line. She’s landed several sweet largemouth bass during the experiment, as well as a carp the size of a toddler, which she caught (appropriately) using pepperoni pizza crust as bait. 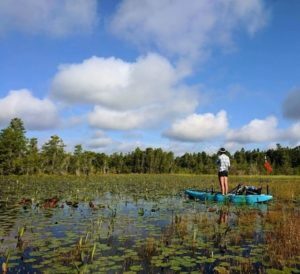 “When I’m fishing, or doing anything else, I just want to find adventure,” Angela says. Chasing those mysteries and finding such experiences fuel Angela.